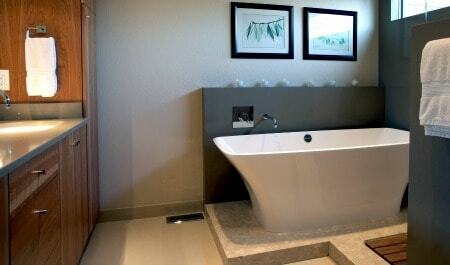 When it comes to bathroom renovation, you want a bathroom remodeling contractor you can trust. Being trustworthy – delivering on time and on budget – is one reason Melton Design Build has earned one of the highest verified client satisfaction ratings of bathroom remodeling contractors throughout the area, including Boulder, Louisville, Lafayette, Longmont, Niwot, Erie, Superior, Lyons and Gunbarrel. Melton approaches bathroom remodeling with a design-driven perspective. That’s why you can rely on Melton to provide full service design build bathroom remodeling that rewards you with excellent design, smart innovation, sensible functionality and money-saving energy efficiency. Even simple bathroom remodeling projects involve coordinating a whole cast of subcontractors and tasks. Plus, today’s bathroom remodeling industry offers so many choices for products and materials. Count on Melton’s experienced bathroom design build team to deliver the decisions, people and products for your unique bathroom remodeling goals. Our project management expertise and price guarantee also contribute to high client satisfaction by making make the entire bathroom remodeling process a pleasure. Melton is one of the most experienced bathroom remodeling contractors in the area. Over the years, we’ve used our design-driven approach to remodel bathrooms of virtually every size and for every lifestyle. Whether you envision adding a practical extra bathroom for the kids or guests…or creating a master bath suite spa getaway, Melton will reward you with a beautifully designed custom bathroom—and a remodeling experience that’s also beautifully designed to complete your bathroom remodeling project on time and on budget. 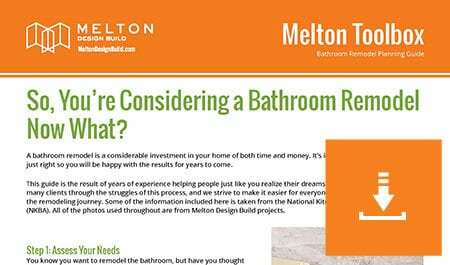 Want to talk to a member of the Melton Design Build team about your bathroom? Contact Us Today!